Tymon Mellor: Hong Kong International Airport handles over 1,000 aircraft movements a day, a long way from the first Hong Kong airfield at Sha Tin, where at 5:10pm on 18th March, 1911 Charles Van den Born, a Belgian undertook the first powered flight in the territory. 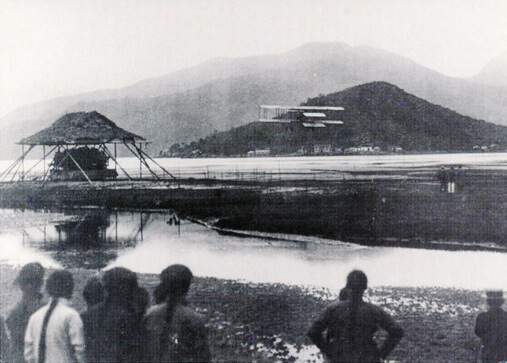 Flying a 1910 Farman Mk II bi-plane named “Wanda”, he made a short flight over the fields and water of Tolo Harbour. As reported by the Hong Kong Daily Press (20th March, 1911), “the biplane rose in less than a hundred yards, soaring upwards to a height of about 300 feet. At this level it encircled the aerodrome, then shot upwards. After sailing round at the greater altitude for some time the planes were adjusted and the machine dived till within a hundred feet or so from the ground. With the quickness and certainty of a bird its downward motion was changed and it sailed along at this height for some time and then alighted easily near the garage. The spectacle was thrilling, and those who witnessed it declared that it was well worth seeing”. The day had not gone as planned. 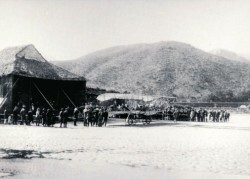 Mr Van den Born had proposed three days of exhibition flying from the Sha Tin site, the ground was flat and with the tide out, there was an ample area for a runway. The “Hong Kong Aviation Week” as advertised in papers was organised by the Far East Aviation Co and admission was by ticket only. For a price of between 50 Cents to $5 you could witness the event from a 4th Class enclosure to a Club enclosure that included seating and a band. A shed had been erected to house the airplane and a meteorological facility established to monitor the weather. A special train had been arranged by the KCRC to take the guests from Kowloon to the site and the Governor, Sir Frederick Lugard was in attendance accompanied by Vice-Admiral Winsloe and Lieutenant General Sir J. Wolfe Murray. 4.00pm Flight with passengers, for a fee of $75, paid in advance by cash or cheque. A large crowd gathered to witness the event on the Saturday. The weather was bright sunshine, however there was a very strong wind blowing and by four o’clock it was announced that it was too strong for safe flying. By 4:30pm most had left, and as The China Mail reported on the 20th March, 1911, “Those who remained on were mostly Chinese, endowed with a big share of Oriental patience”. They were rewarded with the first aeroplane flight in Hong Kong. The weather on the Sunday was ideal for flying but “the birdman did not fly” as reported by the Hong Kong Telegraph on the 27th March, 1911 due to “one cause or another”. On the Monday, a smaller crowd turned out but was not disappointed as from 1:15pm Mr Van den Born made a number of flights. By 4pm it was no longer possible to fly due to the rising tide. The latter also trapped the crowd on the limited dry land, or as the paper recorded, “But all this time, they were in blissful ignorance of the fact that they were being isolated by the incoming tide, which, like a thief in the night, surrounded them on every side almost before they had time to realise their perilous position”. With the band playing, an impromptu bridge was formed from chairs to allow everyone to leave the island. IDJ adds: If you want to read more about Van den Born look at the books “Wings Over Hong Kong” published in 1998 and the recently published “Hong Kong High”. This article was first posted on 17th July 2014. See: http://www.weather.gov.hk/informtc/no10/wanda/ulthm.htm for graphic images of the destruction caused by Typhoon Wanda in 1962 at Sha Tin airfield see Figures X1X and XX1X. Where did the first plane fly in from? Van den Born was interviewed a few days before the flight and he talked about being able to fly 30 miles. It also talks about a successful flight in Bangkok and after HK he was heading to Canton. One assumes given the limitations of the plane and the distance between these places he must have dismantled the plane and took a boat. The Shatin air strip was known as RAF Shatin, but the aircrew were Army Air Corp personnel. The aircraft servicing was handled by RAF technicians. There are photographs of the wrecked Shatin site and aircraft amongst others of Shatin in the aftermath of Typhoon Wanda on the Hong Kong Observatory’s web site somewhere. No jetliner ever landed at Shatin, the runway was was far too short. However, a Hong Kong Airways Vickers Viscount did land at RAF Sek Kong in a bad weather diversion in 1957. The runway there was long enough for a Viscount as similarly sized RAF Canberra jet bombers used Sek Kong when necessary for military exercises. In October 1954 I was posted from RAF Kai Tak to the Army base at Sha Tin. My living quarters was situated just off of the main Sha Tin road and I was transported daily to the airstrip with it’s hangar and crew rooms. Each day started with a parade and inspection which, as an airman, was very foreign to me. I always volunteered to go up with the army pilots on Auster test flights which gave me plenty of opportunities to see the surrounding area from the air. At that time I could never have imagined that Sha Tin was to become the Horse Racing capital of Hong Kong.